Hunting is one of the most important threats to many great ape populations, including bonobos, in central Africa (Kano and Asato 1994, Bowen-Jones and Pendry 1999, Rose 1998, Susman et al. 1981) and it could be one of the determinants of apparent gaps in their historical range (Kingdon 1997, Kortlandt 1995 Kano 1984). Butynski (2001) and Dupain et al. (2001) have attributed recent reductions in the bonobo’s range over the last two or three decades to increased hunting pressure. 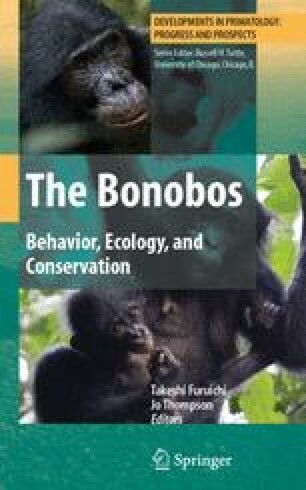 Killing even small numbers of bonobos can have significant and long-term negative impacts on local populations, because of their long maturation, slow reproduction and cohesive social communities.